Mowbray Rangers Jaguars under 12s finished the season in style as they wrapped up promotion. 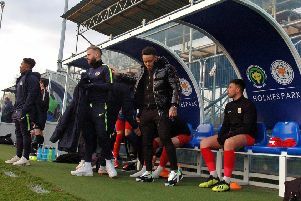 After successive wins against St Andrews, Glenfield and Oadby, Mowbray needed an away win against a resurgent Leicester Nirvana to seal second spot and promotion. This was done in style with a 9-0 win and with two games in hand. The Jags were left hoping rivals Ibstock would drop points in one of their last two games to set up a title decider, but it was not to be and Ibstock sealed the title. But they were happy with the runners-up trophy and go into Mowbray Rangers annual international tournament at Asfordby Hill this weekend in fine form. The team move into 11-a-side football next season under 13s and will look to recruit more suitable players for the 2018/19 season. Games are played on Sundays, with training on Tuesdays. For details, contact Dr Mark Swinscoe on 07906 080602.